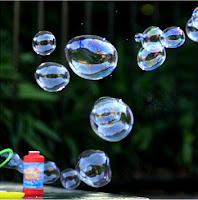 Making your own bubble blowing solution can save you lots of money and it allows you to keep an almost endless supply. It is easy to make your own bubble blowing solution so now you can be ready anytime a child runs to you saying that they are bored. 1 Tablespoon liquid corn syrup – Many people use this to strengthen their bubbles but remember that bees and wasps like sweet liquids. 1 Tablespoon glycerin – This is a better option. It can be bought at pharmacies very cheaply. Have fun this summer and blow lots of bubbles! thanks a lot for posting the bubble blowing solution. my niece loves to visit our place. we'll have a bubble blowing bonding one of these days. thanks. hi! What a great blog you have here. Please add me to your blogroll http://forwardpush.blogspot.com and i'll do the same. please don't forget to inform me after. THanks much and go blog bLOOM! I would have never thought to add something to strengthen the bubbles! Thanks for the tip!